DailyWhitt: DON'T LICK THAT FLAGPOLE! What Christmas season would be complete without watching, discussing, or even quoting from the film, A Christmas Story? 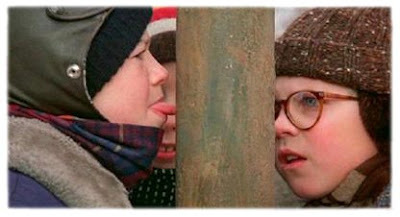 No matter how many times I see it, I still squirm when the kid puts his tongue on the frozen flagpole (“I triple-dog dare you!”). Most shocking about that scene is the same kid admitting that licking the flagpole would be dumb, just before doing it! From what I’ve read of Socrates, he had a concept, which can be summed up as, “knowledge equals virtue.” He believed that people did evil because they were ignorant. They didn’t fully understand the implications of their actions. If they could be made to grasp the reality of evil, they would choose good. So, if someone could truly teach me that eating certain foods, for example, increases my risk of heart attack, I would eventually put down the Greasy Spoon Special, and walk the rabbit-food path of enlightenment. But in my experience, just knowing right from wrong does not cause virtue. No matter how many health lectures someone may attend, they could still be found dead with all the knowledge of the New England Journal of Medicine in one hand and a triple bacon cheeseburger in the other! That flagpole-licking kid, still took the stupid dare, knowing that it was stupid. I’d imagine we could all find examples in our own lives where we've engaged in some goofy behavior, with full knowledge that it’s goofy behavior. Whether peer-pressure, personal pleasure, or stubbornness is to blame, we all have done bad things with full knowledge that they were bad things. In the ancient world, the concept of believing in something was such that the believer changed their behavior and lifestyle to conform to their belief. To believe in Jesus verbally or intellectually only scratches the surface. Your life has to change. This is a clear indication that your life is changing. To hold to His teaching means to stay in a constant state of obedience to it. It means you discipline your life in such a way that if Jesus says it, you do it - daily! Prayer, Bible study, ministering, worship, witnessing are all spiritual disciplines to which he calls us. Wow, do you see how using this last statement alone, almost sounds out of context? The truth will set you free. Well, only after you know the truth. And you’ll know the truth only after you are a disciple of Jesus. And you’ll only be a disciple of Jesus if you hold to his teaching. And you’ll only hold to his teaching if you believe in him, and put your faith in him! Jesus reminds us that he is the one behind this sequence of events I just listed. Yes, we have to believe, hold to, become disciples and know the truth, in order to be set free. But Jesus, the Son of God, is ultimately responsible for our manumission. We are saved by God’s grace, through faith in Christ - And not even the faith we put in Christ is ours. It comes from God, too! So, put your faith in Jesus, hold to his teaching, be his disciple, know the truth, and whatever you do, don't lick that flagpole!